I’ve never felt the need to own his and hers thermometers. After all, they all check your temperature well enough. Sure, some are better to use on squirming children, but between men and women it’s all pretty much the same. However, the Japanese feel very different than I do as it turns out. 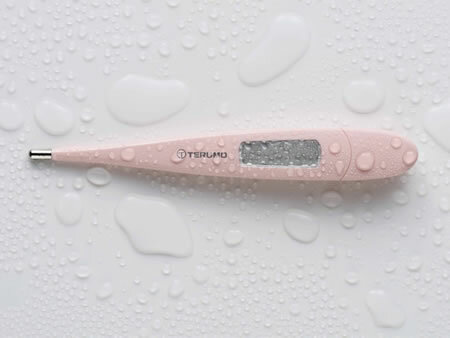 Instead of sharing a thermometer, they have a special washable thermometer just for women. This Celsius thermometer features a backlight that’ll allow for you to even read the temperature in the dark. Again, yet another thing that I didn’t think I needed. It’s always so nice to have vendors out there to let you know what you didn’t know you always needed. Like a pink little thermometer that can be washed up after you’re finished. These will be released September 1st for only $35. Well… some women check for their fertile days by sticking a thermometer up their vaginas. I suppose that’s why you’d like a washable one specially for that purpose, and that won’t be confused and be put on your child’s mouth.